Themes set the look and feel of your concrete5 site. Themes are presentation focused, and control how your site's content is presented. Themes are a collection of files that include all the HTML, CSS, images (and any other unique elements) needed to render your page in a web browser. 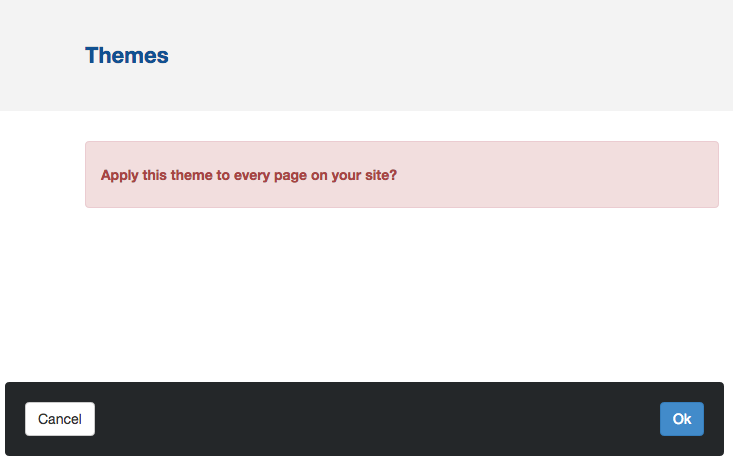 The Dashboard's Themes page lists all the themes currently installed on your site. Beside each are several buttons that control options useful for managing the theme. To apply a theme to your site, you must activate it. Only one theme can be activated at any given time. The theme highlighted in blue is always the currently activated theme. In the example above, the active theme is Elemental. Click the "Activate" button to apply a different theme. The theme will be applied to every page in your site. Click the Install button to install the theme. After you've done so, it's a good idea to check out the newly installed theme and make sure any included page types are installed. You can do this by clicking the theme's Inspect button (this will show up next to the theme once it's successfully installed). Note: themes downloaded from the concrete5.org Marketplace will not typically need to be installed manually. Instead, they'll be installed automatically when you install the package from Dashboard > Extend concrete5. You can easily download new themes from the concrete5.org marketplace. Just click "Get More Themes" and you'll be browsing new looks for your site in no time. You can purchase, download and install stuff without ever leaving your Dashboard. You can even find many free themes and add-ons, so be sure to check it out.